This past weekend I made a whirlwind visit to EAA AirVenture in Oshkosh. I packed as much as I could into my twenty-four hours at the show. I intend to write more about the things I saw and experienced at AirVenture in the coming days. In the meantime I wanted to share an unexpected highlight, and also share a of my photos for those not able to make it to this years event. I have attended AirVenture several times in the past. Though, I have never departed from the main event at Wittman Regional Airport to visit the Seaplanes. This year after checking out the few seaplanes that landed at the airport I decided to take the short bus ride to lagoon in the western shore of Lake Winnebago to check out the seaplanes. The moment I arrived I was so glad I made the trip. After leaving Wittman with the huge crowds and non-stop activity it was nice to take a quiet stroll down a wood-chipped path that opened up to a beautiful lagoon that serves as a the EAA AirVenture Seaplane Base. For three dollars you can take a 15 minute pontoon boat ride through the lagoon giving you a chance to view the planes up-close. My pontoon boat captain had flown down from Canada earlier this week in his seaplane and enjoyed talking with us about all the planes in the cove. So if you are are at Oshkosh or planning to make the pilgrimage later this week then take an hour or two to re-charge your batteries with a visit to the EAA AirVenture Seaplane Base. Speaking of seaplanes, later in the day while walking through the exhibit hall I met George Erickson, author of True North. In his book he writes about his experiences flying through the Alaska, the Yukon and Northwest Territories in a Piper PA-11 Seaplane. After a brief conversation with him I knew I had to read his book. I look forward to cracking it open this evening. I have uploaded a variety of my photos from my trip to Oshkosh including a few photos of the Seaplane base. It is that time of year again where pilots from around the world descend on an airport in central Wisconsin for a week long celebration of Aviation that is EAA AirVenture. Thousands of planes descend on Oshkosh making it the busiest airport in the world for a few days. For aviation enthusiasts this is an event you need to attend this event once in your life. I was unable to attend last year but had a great time at AirVenture in 2006. I will be participating in the 2008 Aviation Blogger Fest at 4pm on Monday. 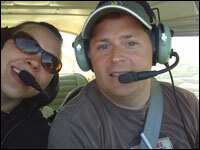 Fellow blogger, Rob Mark of Jetwhine, has organized an event specifically for aviation bloggers. I am looking forward to meeting some of the bloggers I interact with online but have yet to meet in person. I will post a few short updates through Twitter (MyFlightBlog) while in Oshkosh and then post a summary later in the week on MyFlightBlog. Pilots that have an iPhone can now add a seriously powerful new application to their phone that gives them access to a wide variety of flight planning and preparation information. ForeFlight Mobile 2.0 Preflight Intelligence is the handy pilots assistant that can take you from the start of your planning straight through to filing a flight plan. Simply open the application and use the Airport Facilities Directory (A/FD) to find your desired destination. The team at Foreflight have made the information in those green Airport Facilities Directories available electronically, and not just for your particular region. They have data for over 220 countries including 25,000 landing facilities. You can review airport data such as frequencies, runway lengths and even view runway, taxiway diagrams and even access to sectional charts. The tool helps you plan a visit to the local fixed based operator, review local lodging options and has information for transportation providers. You can even view the airports location on a Google map to plan getting to or from an airport or to see an aerial view of nearby terrain. If you are planning a flight you are surely going to be interested in some additional information that is but a tap away. The alerts tab shows NOTAMs for the airport you are looking at. If you are ready to review weather conditions tap the WX button to receive the current weather observation at the airport, which provides the METAR and even a translation for the METAR. From the weather page you can look at various weather data including current winds aloft information and a looped radar image. There is also an option to view forecasted weather data but if a TAF is not published for the airport you are looking at it will not return any data. I would love to see in an update a few TAF reports for airports within a 25-mile proximity of the airport being looked at. From a higher level you can view national and regional radar images, Airmets, Sigmets and prognostic charts from the weather section of Foreflight. If you are ready to fly and want to file a flightplan ForeFlight can even help you with that. This is the one part of the functionality that I have not yet used. According to the ForeFlight website you can file new flight plans "in under ten seconds and view your complete flight plan filing history." Flight plan submissions are through a CSC Duats account. Although, this iphone app will not fully replace all the online resources I use for flight planning it is a valuable tool that will be extremelly handy while on-the-go or at the airport. 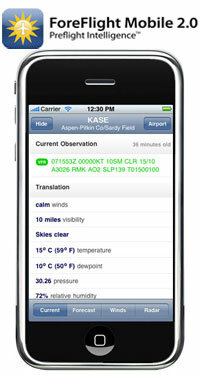 If you are an iPhone enabled pilot I highly recommend you check out ForeFlight Mobile 2.0 Preflight Intelligence. It is available through the iPhone App store for a one-time charge of $69.99. The 19th Annual Season of Wings of Freedom is underway and their magnificent bombers have arrived back in the Chicago area. The Collings Foundation has spent the last twenty years recovering and restoring historic aircraft. Four amazing airplanes will be on display at Chicago airports and also flying paying customers for a once-in-a-lifetime experience. The Fleet that arrived in Chicago this week includes a B-17 Flying Fortress, B-24 Liberator, B-25 Mitchell and a new addition this year a P-51 Mustang. 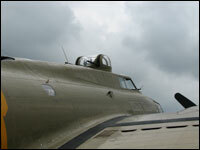 Customers can book flight experiences by visiting the Collings Foundation website. Or come out to one of the local airports during the dates below to see the aircraft and hear the roar of their engines. The Collings Foundation invited me to fly in their B-17 Flying Fortress as it was flown from Valparaiso to Chicago Executive Airport last year. All, I can say is that flight was truly a once-in-a-lifetime experience. There are fewer and fewer of these amazing aircraft still in flying condition and it was a thrill just to hear its engine and awesome to experience the plane in flight. I was lucky to be accompanied on that flight by a former WWII B-17 Pilot which made the experience all that more amazing. If you are in the Chicago area be sure to check out these amazing aircraft while they are in the area. If you are outside of Chicago look up their schedule on the Collings Foundation website. A couple of weeks ago I received an e-mail from a reader of this blog who is a fellow Chicagoan that was interested in my opinion of a few local flight schools. After going back and forth through e-mail we had one of those "It is a small world" moments when we realized a few years ago we had both been contributors to the same blog, Chicagoist.com. Peter mentioned that as of late he had really been suffering from the aviation bug. He finds himself looking to sky more and more often and is ready to learn to fly. With the pilot population in decline I wanted to be sure to do all I could do to help Peter achieve his goal of earning a pilots license. This past week I signed up to be Peter's mentor in AOPA's Project Pilot Program. AOPA developed the program as part of their commitment to growing the pilot population. For me it is an opportunity to support his efforts and share in his experiences and I hope that I can provide him some valuable advice that I would have appreciated while learning to fly. Not to mention it is great having another person to talk to who loves aviation. This weekend he joined me and two other members of the Chicago Aviation Meetup Group for a seminar on Takeoffs, Landings and Low Altitudes Maneuvering at the DuPage Airport. Although the seminar was bit disappointing it was a great excuse for some aviation enthusiasts to get together at an airport. The four of us, two pilots and two perspective pilots, stood at the flightline fence enjoying a conversation on aviation and even judging a few landings. While at the airport we stopped in to The Pilot Shop where Peter picked up a logbook which will come in handy in the coming weeks as he takes his first introductory flight. 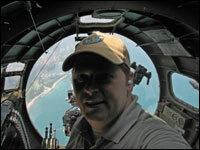 Peter has setup a blog, Flying in Chicago, dedicated to his aviation adventures. I hope you will check it out. One of the things I love most about being a pilot is to be able to see the world from a unique perspective. We live in a world of beautiful sites. Yet, there are limits to what can be seen without the ability to get airborne. Whenever I fly commercially I love sitting in a window seat so I can check out amazing landscapes and look for sights that might otherwise be missed by those on the ground. Since learning to fly I have enjoyed on several occasions discovering something from above that I would surely have missed or been unable to see from the ground. Things like corn mazes, shipwrecks and Civil War Munitions Factory. While enjoying the Fourth of July holiday in Door County, WI; My wife and I decided to spend an afternoon flying. It was during this flight that we enjoyed checking out another beautiful view that we would have missed without the aid of the airplane. 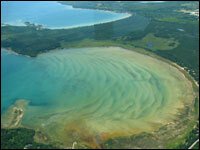 We overflew Moonlight Bay, from the ground it is just another beautiful bay along the Door County Peninsula. But, from above it was an amazing mixture of colors. The bay had a rust color close to shore that then melted into the deep blue of Lake Michigan. We circled the bay and snapped a few photos to share with the family. Cynthia and I have been by Moonlight Bay before while visiting nearby Cana Island Lighthouse. But, had no idea how drastically different it looked from the sky. You can view a wonderful ground level photo of Moonlight Bay on Flickr that shows how drastically different it looks from the ground. This was just one of many highlights during the flight. When we arrived at Ephraim we thought we were the only airplane in the area as the radios had been silent and no one responded to any of my calls to the Ephraim CTAF. As we started to enter the pattern for the asphalt runway their I spotted a tail dragger taking off from the turf runway. Shortly after taking off he abruptly cut into the pattern for the asphalt runway and proceeded to land, completely oblivious to my presence, despite my frequent radio calls. I made a few more radio calls without a response from that plane. It was apparent they were not equipped with radios or simply were not using them. I decided to circle and setup for a new entry into the pattern to ensure there was plenty of separation between me and this plane. Just about then another airplane chimed in that they were inbound for landings at Ephraim and commented they would follow us in the pattern. As I was about to turn on to final approach to land, I noticed that the radio-less plane decided not to clear the runway and wait at the end before back taxiing and started to slowly back-taxi on the active runway. So, I decided to perform a go-around. I gave the inbound airplane and update on the situation. From that point forward the two of use would share updates with each other about what this other plane was doing. After another ride around the pattern we landed at Ephraim. There we were met by my older brother and two of his three kids. They were in the area and knowing we were planning to land there decided to stop in to watch. I enjoyed showing the kids the plane and letting them sit in the cockpit. While we were on the ground the airport traffic picked up and four or five planes arrived while we were enjoying our time on the tarmac. The pilot that had shared the pattern with me, the one that I had been in frequent communication with on the radios, stopped over and introduced himself and thanked me for the updates. It was nice meeting the pilot and putting a face to the voice on the radio. On the flight back to Sturgeon Bay we had an aerial view of the 2008 Door County corn maze and also checked out a 1,000 foot ship leaving dock in Sturgeon Bay and heading out into Green Bay. All in all it was a fun afternoon of flying!